I admit. I was a big drifter and I have not had a new release for a while, but I can really explain it. First of all, the design and programming of a new website has been completed. If you did that, you know what I'm talking about. If you do not have to trust me in this case. But the time had come to drop the training wheels and create my own personal page, which I would like to introduce here and now. Secondly, I just returned from the Orlando Food & Wine Conference, which consisted of three part-time workshops especially for food bloggers. I have met many wonderful people, learned a lot of things and am full of new ideas about improving this blog. 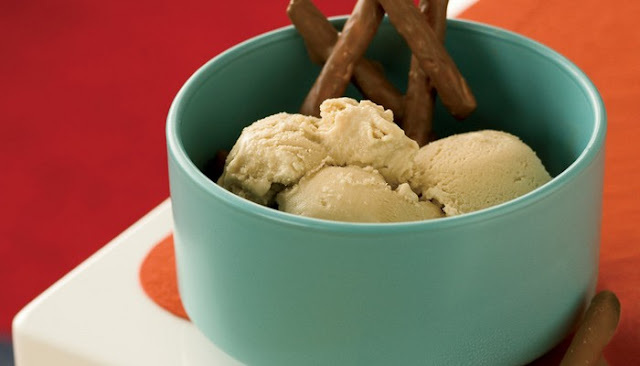 So, finally, what is a better way to celebrate all this new excitement than with some fanfare in the form of Guinness ice cream with chocolate covered pretzels? Originally I made this recipe a few years ago for a Super Bowl party, but it seemed like the perfect ending to a recent barbecue in the backyard after the grilled sausages and German potato salad. And to my little trick, how to dry the pretzels for the most beautiful end product. Greetings and thanks for visiting Bistro OneSix! 1. Scrape the vanilla seeds into a medium-sized pan. Add the pod, milk and cream. Bring to a boil at medium temperature. Turn off the heat, cover the pan and let the flavors draw for 30 minutes. 2. Meanwhile, mix the fat and molasses in a small pan over medium heat. Bring to the boil and extinguish the fire. 3. Beat egg yolks, sugar and vanilla extract in a large bowl. Mix a few tablespoons of the warm cream mixture and slowly add another ¼ cup of the cream. Add the remaining cream in a constant stream and continue to beat. Pour the mixture back into the pot. 4. Stir the beer mixture through the cream mixture. Cook the pudding over medium heat and stir with a wooden spoon for 6 to 8 minutes or until the cream is thick enough to cover the back of the spoon. 5. Place the mixture in a container and leave it in the refrigerator for at least 2 hours or a night. Process the pudding in the refrigerator according to the manufacturer's instructions. 6. When you have finished making ice cream, chop a few of the chocolate coated pretzels (instructions below) and add them, save what to use as a side dish. 1. Cover a parchment baking sheet. Melt the chocolate in a heat resistant container on a pan with boiling water or a double boiler if you have one. 2. Allow to cool for 10 minutes and stir occasionally. 3. Add the pretzels and gently stir until it is covered. Put the pretzels on the grease-proof paper with a fork and let the excess chocolate drip back into the bowl. Or my method is to use pretzels, put the skewers through the holes and hang the skewers between two pots to dry them. In this way there is no flat size for the pretzel and I think they look a little better. 4. Allow to dry until the chocolate is complete. I am absolutely a fan of the combination of salty / sweet taste... I LOVE chocolate covered with chocolate, they are my favorites. I love Fleur de sel sweets, chocolate cookies with a hint of salt... all very good. So I decided that I wanted to treat a kind of pretzel crust recently. I remembered a dessert when I was little... I think it was a dessert of strawberry jelly and cream cheese with a pretzel crust? Something like that. I have always loved the crust. I think I would even scrape the jelly and eat the crust with cream cheese. Anyway, that's what I came with: the chopped chocolate ice cream. Chocolate ice cream stands out due to the pretzel of bark. Chocolate ice cream bites with pretzel crust are the perfect sweet and salty ones! That is so simple! Pulverize your pretzels into crumbs (I used the bottom of a heavy glass). Melt the butter / butter in a microwave dish and add the pretzels, sugar and salt. Cover a can of mini muffins with paper liner and place some crust mixture in each liner. Fall with the back of a spoon. Put a tablespoon of chocolate ice cream in each cup, take a spatula and flatten the top. Squeeze a pretzel or a few chocolate pieces into each bite of ice cream. Cover the muffin mold with grease-proof paper and freeze for about an hour. The same for ice cream! You can adapt this recipe to your nutritional needs... of course my version is vegan, but I can even make it gluten free with GF pretzels, or just go traditional with milk ice cream and regular pretzels. Good luck, but one thing to eat... these chocolate ice cream bites are delicious! I think that's a nice dessert for a summer party. Simply refreshing chopped candies.